10회향(十廻向, 十迴向, 영어: ten sorts of turned wish, ten dedications, ten dedications of merit)은 다음의 분류, 그룹 또는 체계의 한 요소이다. 대승불교에서 널리 받아들여지고 있는, 《보살영락본업경》에서 설하고 있는 보살 수행계위인 10신 · 10주 · 10행 · 10회향 · 10지 · 등각 · 묘각의 52위 가운데 10회향을 말한다. 대승불교의 경전인 《화엄경》에서 설하고 있는 보살 수행계위인 10주 · 10행 · 10회향 · 10지 · 불지(佛地)의 41위 가운데 10회향을 말한다. 대승불교의 화엄종의 법장이 《화엄경탐현기》에서 세운 보살 수행계위인 10신 · 10해(十解) · 10행 · 10회향 · 10지 · 불지의 51위 가운데 10회향을 말한다. 대승불교의 경전인 《인왕경》에서 설하고 있는 보살 수행계위인 10신 · 10주 · 10행 · 10회향 · 10지 · 묘각의 51위 가운데 10회향을 말한다. 대승불교의 경전인 《수능엄경》에서 설하고 있는 보살 수행계위인 간혜지(乾慧地) · 10신 · 10주 · 10행 · 10회향 · 4가행(四加行) · 10지 · 등각 · 묘각의 57위 가운데 10회향을 말한다. 《월인석보》 제2권에서 설하고 있는 보살 수행계위인 간혜지(乾慧地) · 10신 · 10주 · 10행 · 10회향 · 4가행(四加行) · 10지 · 등각 · 금강혜(金剛慧) · 묘각의 58위 가운데 10회향을 말한다. 대승불교의 법상종의 규기가 세운 보살 수행계위인 10주 · 10행 · 10회향 · 10지 · 묘각의 41위 가운데 10회향을 말한다. 대승불교의 법상종의 원측이 세운 보살 수행계위인 10신 · 10주 · 10행 · 10회향 · 10지 · 등각 · 묘각의 52위 가운데 10회향을 말한다. 10회향(十廻向, 十迴向)은 줄여서 10향(十向)이라고도 하고 10회향심(十廻向心, 十迴向心) 또는 10회향법(十廻向法, 十迴向法)이라고도 한다. 10원(十願)이라고도 한다. 대승불교에서 널리 채택하고 있는 《보살영락본업경》의 52위의 보살 수행계위에 따르면 10회향의 순서와 명칭은 다음과 같다. 회향(廻向, 迴向)은 대비심(大悲心)으로 현재까지 쌓은 공덕을 일체(一切)의 중생에게 돌려서 그들을 구호(救護)하는 것을 말한다. 따라서, 10회향은 10선 · 10주 · 10행을 통해 개발된 선한 힘을 대비심(大悲心)으로 모든 유정에게 돌려서 그들의 고통[苦]을 구제[救]하고 그들을 보호[護]하는 것을 말한다. 여기서 유의할 점은 대자심(大慈心)이나 대자비심(大慈悲心)이 아니라 '대비심(大悲心)'이 바탕이 되어 회향하게 된다는 점과 일부의 유정들 즉 자신과 친한 유정들만이 아니라 '모든' 유정들에게 회향한다는 점이다. 대비심(大悲心)은 자(慈) · 비(悲) · 희(喜) · 사(捨)의 4무량심(四無量心) 가운데 두 번째의, 유정의 고통을 없애주려는 마음, 즉 미혹(즉, 4성제의 집제)이라는 원인의 필연적인 결과인 고(즉, 4성제의 고제)를 없애주려는 마음인 비무량심(悲無量心)을 말한다. 따라서, 비무량심(悲無量心)의 마음이 바탕이 되어 이루어지는 이타행이 10회향이다. 이전의 10행도 이타행이지만 10행은 대자심(大慈心) 즉 자무량심(慈無量心)이 바탕이 된 이타행으로 대비심(大悲心)이 결여되어 있으며, 따라서 실제로는 '모든' 유정을 향해 발휘되지는 못한다. 즉, 아직 진(眞) 즉 성인의 마음이 많다기 보다는 속(俗) 즉 범부의 마음이 많은데, 이런 상태를 넘어서는 열쇠가 대비심(大悲心)이다. 이러한 취지에서 《월인석보》 제2권에서는 10주와 10행 그리고 10회향과의 관계에 대해 다음과 같이 말하고 있다. 회향(廻向)은 돌이켜 향한다는 것이니 먼저의 10주(十住) · 10행(十行)은 세속(世俗)에 날 마음이 많고 대비행(大悲行)이 사나우니, 이는 반드시 비원(悲願)으로 이루어 세속에 있어 중생을 이롭게 하여 진(眞)을 돌이켜 속(俗)으로 향하며, 지(智)를 돌이켜 비(悲)를 향하여 진(眞)과 속(俗)과가 어울리며, 지(智)와 비(悲)와가 한가지로 하므로 이 이름이 회향(廻向)이며, 또 10원(十願)이라 하니, 닦아 나아가는 행적이 여기에 다다라 갖춰진다. 세 현인(賢人)의 지위가 지극(至極: 극한에 이름)하지만 여기에 또 공부 행적을 더하여야 성인(聖人) 지위에 들 것이다. 세 현인의 지위는 10주(十住) · 10행(十行) · 10회향(十廻向)이다. 그리고 대자비심(大慈悲心)은 부처가 가지는 마음을 가리키는 낱말이다. 즉, 일체지(一切智)와 4무량심을 모두 증득했을 때 무연(無緣)으로 발현되는 마음인 무연대비(無緣大悲: 인연이 없어도 자비를 베풀음)의 자비(慈悲) 즉 자(慈)와 비(悲)의 마음작용을 말한다. 4향4과, 수다원, 현관 (불교), 성인과 범부 문서를 참고하십시오. 52위 가운데 10신(十信)과 10주(十住)는 스스로를 진리에 안착하게 하는 자리행(自利行)이다. 이에 비해 10행(十行)은 다른 유정들로 하여금 진리에 안착하게 돕는 이타행(利他行)이다. 즉, 먼저 스스로 진리에 안착한 후 다시 다른 유정들이 진리에 안착하도록 돕는 것이 10행까지의 흐름이다. 그리고, 10회향은 지금까지 획득된 공덕을 '모든' 유정들에게로 향하게 하려는 대비심(大悲心)을 바탕으로 하는 커다란 서원[大願]의 마음이자 실천이다. 그리고 이 마음과 실천을 통해 10지의 제1단계인 초지(初地) 즉 환희지(歡喜地)에 들어서게 되며, 이것은 성인의 지위이며 수행자는 진정 성도(聖道: 불교 즉 깨달음의 가르침, 성인의 길)를 가게 된다. 행담 (2008). 《『화엄경』「十地品」에 나타난 修行次第에 관하여》. 지도교수 해주. 1]10종의 회향. 보살의 수행 계위(階位)인 52위 중에서 제31위부터 제40위까지를 말함. 구호중생이중생상(救護衆生離衆生相) 회향, 불괴(不壞) 회향, 등일체제불(等一切諸佛) 회향, 지일체처(至一切處) 회향, 무진공덕장(無盡功德藏) 회향, 입일체평등선근(入一切平等善根) 회향, 등수순일체중생(等隨順一切衆生) 회향, 진여상(眞如相) 회향, 무박무착해탈(無縛無著解脫) 회향, 입법계무량(入法界無量) 회향 등." 不壞 - 'indestructible dedication.' 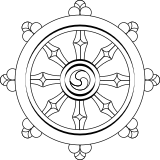 The rank where one sees emptiness easily without analyzing all dharmas. 等一切諸佛 - 'Dedication equal to all buddhas.' The stage where one continually broadly penetrates the teachings of all the buddhas of the three worlds. 至一切處 - 'dedication reaching all places.' The stage where one enters all Buddha-lands and practices cultivation together with all buddhas. 無盡功德藏 - 'dedication of inexhaustible treasuries of merit.' The stage of teaching people the meritorious dharma of the ever-present buddha-nature without exhaustion. 隨順平等善根 (入一切平等善根) - 'Dedication causing all wholesome roots to endure.' The stage of practicing the virtues of the uncontaminated middle path, and seeing that good and evil are not two. 隨順等觀一切衆生 (等隨順一切衆生) - 'Dedication equally adapting to all sentient beings.' The stage where one sees that the good and evil actions of all sentient beings are not distinguished. 眞如相 - 'Dedication with the character of true thusness.' The stage where the bodhisattva, using the wisdom of the middle path, clarifies existence and nonexistence, and sees that everything is the reality-realm. 無縛解脫 (無縛無著解脫) - 'unbound liberated dedication.' The stage where one breaks off attachment with the view of all dharmas being the same, which he experiences through the wisdom of prajñāpāramitā. 法界無量 (入法界無量) – 'Unfathomability of the dharmadhātu,' also called 'Boundless dedication equal to the cosmos.' The stage where the bodhisattva witnesses that all existences are the middle path without aspects. 解釋: The fifty-two stages in the process of becoming a Buddha; of these fifty-one are to bodhisattvahood, the fifty-second to Buddhahood. They are: Ten 十信 or stages of faith; thirty of the 三賢 or three grades of virtue i. e. ten 十住, ten 十行, and ten 十廻向; and twelve of the three grades of 聖 holiness, or sainthood, i. e. ten 地, plus 等覺 and 妙覺. These are the Tiantai stages; there are others, and the number and character of the stages vary in different schools. "五十二位(오십이위): 보살수행의 계위를 52로 나눈 것. 곧 10신(信)ㆍ10주(住)ㆍ10행(行)ㆍ10회향(廻向)ㆍ10지(地)ㆍ등각(等覺)ㆍ묘각(妙覺). 전(前)의 51위는 수행의 인(因), 후의 1위는 수행의 과(果)." 解釋: 十廻向 [py] shí huíxiàng [wg] shih hui-hsiang [ko] 십회향 sip hoehyang [ja] ジュウエコウ jū ekō ||| 'Ten dedications (of merit).' A group of ten of the fifty-two stages of the path of bodhisattvahood in Mahāyāna Buddhism. Returning the fruits of all of one's practice to all sentient beings. These ten are: 1. jiuhuzhongshenglizhongshengxiang 救護衆生離衆生相 'Dedication to saving all beings without any mental image of sentient beings.' The stage where one, whīe using the mind of no-aspects to save sentient beings, is still separated from the aspects of 'not-yet-saved beings.' 2. buhuai 不懷 - 'indestructible dedication.' The rank where one sees emptiness easily without analyzing all dharmas. 3. dengyiqiefo 等一 - 'Dedication equal to all Buddhas.' The stage where one continually broadly penetrates the teachings of all the Buddhas of the three worlds. 4.zhiyiqiechu 至一切處 - 'dedication reaching all places.' The stage where one enters all Buddha-lands and practices cultivation together with all Buddhas. 5.wujingongdemie 無盡功德滅 - 'dedication of inexhaustible treasuries of merit.' The stage of teaching people the meritorious dharma of the ever-present buddha-nature without exhaustion. 6.suishunpingdengshangen 隨順平等善根 - 'Dedication causing all roots of goodness to endure.' The stage of practicing the virtues of the middle path of no-outflow, and seeing that good and evil are not two. 7.suishundengguanyiqiezhongsheng 隨順等觀一切衆生 - 'Dedication equally adapting to all sentient beings.' The stage where one sees that the good and evil actions of all sentient beings are not distinguished. 8.zhenruxiang 眞如相 - 'Dedication with the character of true thusness.' The stage where the bodhisattva, using the wisdom of the middle path, clarifies existence and non-existence, and sees that everything is the reality-realm. 9. Wufujietuo 無縛解脫 - 'unbound liberated dedication.' The stage where one breaks off attachment with the view of all dharmas being the same, which he experiences through the wisdom of prajñāpāramitā. 10. fajiewuliang 法界無量 - 'Boundless dedication equal to the cosmos.' The stage where the bodhisattva witnesses that all existences are the middle path without aspects. ↑ 세종대왕기념사업회 (2001). 《한국고전용어사전》 "십지(十地)", 네이버 지식백과. 2013년 4월 13일에 확인. "십지(十地): 부처가 되는 층을 10으로 쳤을 때, 일곱째 층. 십지는 먼저의 법(法)을 모아 진실됨에 이르러 일체 불법(佛法)이 이로부터 나므로 지(地)라 함. ㉡오직 일생보처보살 밖에는 일체 성문이며, 벽지불이며, 지에 못 올라 있는 보살들이<지는 십지이다.> 모두 진실로 믿어 앎을 못한다… ; 오직 一生補處菩薩外예 一切 聲聞이며 辟支佛이며 地예 몯 올앳 菩薩히<地 十地라> 다 眞實로 信야 아로 몯니… [석보상절 권제9, 28장 앞쪽～뒤쪽]"
보살이 닦은 공덕을 널리 중생에게 돌리는 열 가지. (1) 구호일체중생리중생상회향(救護一切衆生離衆生相廻向). 공덕을 중생에게 돌려 모든 중생을 차별하지 않고 구제하고 보호함. (2) 불괴회향(不壞廻向). 굳은 믿음을 중생에게 돌려 중생이 이익을 얻게 함. (3) 등일체불회향(等一切佛廻向). 모든 부처가 한 것과 같이 공덕을 중생에게 돌려 줌. (4) 지일체처회향(至一切處廻向). 자신이 닦은 청정한 일을 두루 중생에게 이르게 함. (5) 무진공덕장회향(無盡功德藏廻向). 끊없는 공덕을 중생에게 돌려 중생이 그 공덕을 얻도록 함. (6) 수순평등선근회향(隨順平等善根廻向). 자신이 닦은 청정한 일을 중생에게 돌려 중생이 청정한 일을 하게 함. (7) 수순등관일체중생회향(隨順等觀一切衆生廻向). 자신이 닦은 모든 청정한 일을 중생에게 돌려 모든 중생을 이익되게 함. (8) 여상회향(如相廻向). 자신이 닦은 청정한 일을 있는 그대로 중생에게 돌려 줌. (9) 무박무착해탈회향(無縛無著解脫廻向). 모든 대상에 집착하지 않고 해탈한 마음으로 자신이 닦은 청정한 일을 중생에게 돌려 줌. (10) 법계무량회향(法界無量廻向). 한량없는 청정한 일을 거듭 닦아 이를 중생에게 돌려 중생을 진리의 세계에 들게 함. 1]보살의 수행 계위(階位)인 52위 중에서 제31위부터 제40위에 있는 보살이 실천하는 여러 가지 수행법. ↑ 세종대왕기념사업회 (2001). 《한국고전용어사전》 "십회향(十廻向)", 네이버 지식백과. 2013년 4월 12일에 확인. "십회향(十廻向): 부처가 되는 층을 열로 쳐서 다섯째 층. 십행(十行)을 끝내고, 다시 지금까지 닦은 자리(自利)•이타(利他)의 여러 가지 행(行)을 일체 중생(衆生)을 위하여 돌려주는 동시에, 이 공덕으로 불과(佛果)를 향해 나아가 오경(悟境)에 이르려는 지위(地位). 회향(廻向)은 돌이켜 향한다는 것임. 십지는 부처가 되시는 층이 열로 쳐서 일곱째 층이니 가장 처음은 건혜지이고, 둘째는 십신이고,…다섯째는 십회향이고,…열째는 묘각이다.…회향은 돌이켜 향한다는 것이니 먼저의 십주•십행은 세속에 날 마음이 많고 대비행이 사나우니, 이는 반드시 비원으로 이루어 세속에 있어 중생을 이롭게 하여 진을 돌이켜 속으로 향하며, 지를 돌이켜 비를 향하여 진과 속과가 어울리며, 지와 비와가 한가지로 하므로 이 이름이 회향이며, 또 십원이라 하니, 닦아 나아가는 행적이 여기에 다다라 갖춰진다. 세 현인의 지위가 지극하므로 여기에 또 공부 행적을 더하여야 성인 지위에 들 것이다. 세 현인의 지위는 십주•십행•십회향이다.… ; 十地 부텨 외시 層이 열흐로 야 닐굽찻 層이니  처믄 乾慧地오 둘차힌 十信이오…다차힌 十廻向이오…열차힌 妙覺이라…廻向 도 向 씨니 몬졋 十住 十行 世俗애 날 미 하고 大悲行이 사오나니 이 모로매 悲願으로 일워 世俗애 이셔 衆生 利케 야 眞 두르 俗 向며 智 두르 悲 向야 眞과 俗괘 어울며 智와 悲왜 가지에  씨 이 일후미 廻向이며  十願이라 니 닷가 나가 뎌기 이긔 다라 니라 세 賢人位 至極거든 이긔  功夫 뎌글 더야 誠人ㅅ地位예 들리라 세 賢人位 十住 十行 十廻向이라… [월인석보 권제2, 59장 뒤쪽～61장 뒤쪽]"
"나제류사(羅諦流沙:진나라 말로는 구호일체중생회향(救護一切衆生廻向)이라고 한다)ㆍ나담사(羅曇沙:진나라 말로는 부괴회향(不壞迴向)이라고 한다)ㆍ필백가(必白伽:진나라 말로는 등일체불회향(等一切佛廻向)이라고 한다)ㆍ법필타(法必他:진나라 말로는 지일체처회향(至一切處廻向)이라고 한다)ㆍ불도타(佛度他:진나라 말로는 무진공덕장회향(無盡功德藏廻向)이라고 한다)ㆍ나차필(羅叉必:진나라 말로는 수순평등선근회향(隨順平等善根廻向)이라고 한다)ㆍ사라차가(師羅叉伽:진나라 말로는 수순등관일체중생회향(隨順等觀一切衆生廻向)이라고 한다)ㆍ파가제(波訶諦:진나라 말로는 여상회향(如相廻向)이라고 한다)ㆍ파라제불타(波羅提弗陀:진나라 말로는 무박해탈회향(無縛解脫廻向)이라고 한다)ㆍ달마변가(達摩邊伽:진나라 말로는 법계무량회향(法界無量廻向)이라고 한다)"
"悲無量心(비무량심): 4무량심의 하나. 보살이 슬피 여기는 마음을 일으켜 한없는 중생의 미(迷)한 고통을 견뎌내어 해탈의 낙을 얻게 하는 마음. 고통을 없애 주는 대비심(大悲心)." "大悲心(대비심): 모든 중생의 괴로움을 없애려는 마음. 곧 불ㆍ보살의 마음." ↑ 한국학중앙연구원 (2010). 《한국민족문화대백과》 "관음신앙(觀音信仰)", 네이버 지식백과. 2013년 4월 12일에 확인. "모든 경전에 나타나 있는 관세음보살의 공통점은 세상을 구하고 생명 있는 자들에게 이익을 주고자 하는 것이다. 부처님의 절대적 자비심인 무연대비(無緣大悲：인연이 없어도 자비를 베풀음)를 중생에게 베풀어서 모든 속박으로부터 벗어나게 하는 권능을 실행하는 힘이 관세음보살이다. 그러므로 모든 불행한 중생이 관세음보살의 이름을 지송하고, 항상 마음속에 새겨서 공경하고 예배하면 해탈을 얻게 된다는 것이다." ↑ 星雲, "十行". 2013년 4월 12일에 확인. ↑ 佛門網, "十行". 2013년 4월 12일에 확인. 한없이 넓고 큰 서원(誓願). 중생이 부처 되려는 소원. 부처가 중생을 구제하려는 서원. "歡喜地(환희지): 【범】 pramuditābhūmi 보살수행의 계위인 52위 가운데 10지(地)의 초위(初位) 이름. 파모제타(波牟提陁)라 음역. 환희(歡喜)ㆍ극희(極喜)ㆍ열예(悅豫)라 번역. 10지 가운데 처음이란 뜻으로 초환희지라고도 함. 보살이 수행한 결과로 이 자리에 이르면, 진여의 이(理)의 일부분을 증득하여, 성인의 지위에 올라 다시는 물러나지 않고, 자리이타의 행을 이루어서 마음에 기뻐함이 많다는 뜻으로 이렇게 이름." 이 문서는 2018년 5월 11일 (금) 05:44에 마지막으로 편집되었습니다.